One of the many joys of living in London is that you are so close to so many other wonderful places. And it’s easy and can be cheap to get there (though this bit is never guaranteed). Sitting in our kitchen one chilly June evening, bemoaning the fact that the British summer still hadn’t bothered to turn up, I idly started googling last minute breaks. 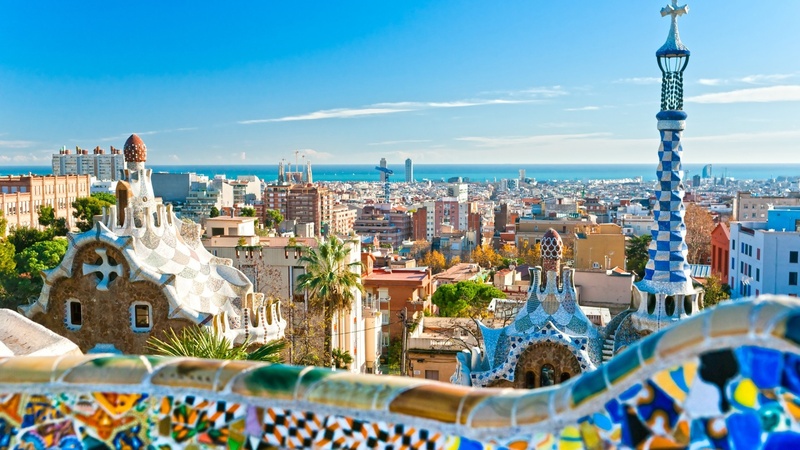 Next thing you know we’ve booked to go to Barcelona two days later for a fantastically cheap two-night break. Hooray! So it’s time to share some of my favourite bits of this great city with you. We stayed close to the stunning Sagrada Familia. 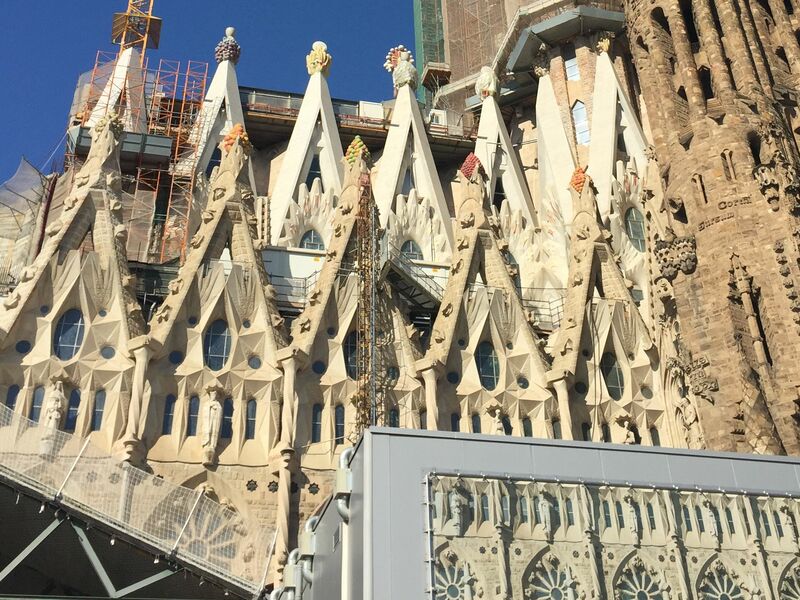 The most beautiful unfinished building in the world, this amazing temple was started on in 1882 and Antoni Gaudi, the greatest architect Barcelona has ever seen, spent over 40 years on it until his death in 1926. On the subject of this incredibly slow construction he is said to have remarked: “My client is not in a hurry.” Less than a quarter of it was complete when he died. Many others have been involved in this gargantuan project since. Based on early 20th century building techniques, the building work was expected to go on for hundreds of years but recent computer-aided design technology has sped up the construction significantly. Thank goodness for that. It is hoped it will be complete by 2026 which is the centenary of Gaudi’s death. I have to say it didn’t look anywhere near finished to me with cranes towering over it, but it does take your breath away…every time it comes into sight. Could be my favourite building in the world. I’ve got to see it finished! You can see Gaudi’s genius scattered all around the city like the fabulous Casa Mia (how I’d love to live there! 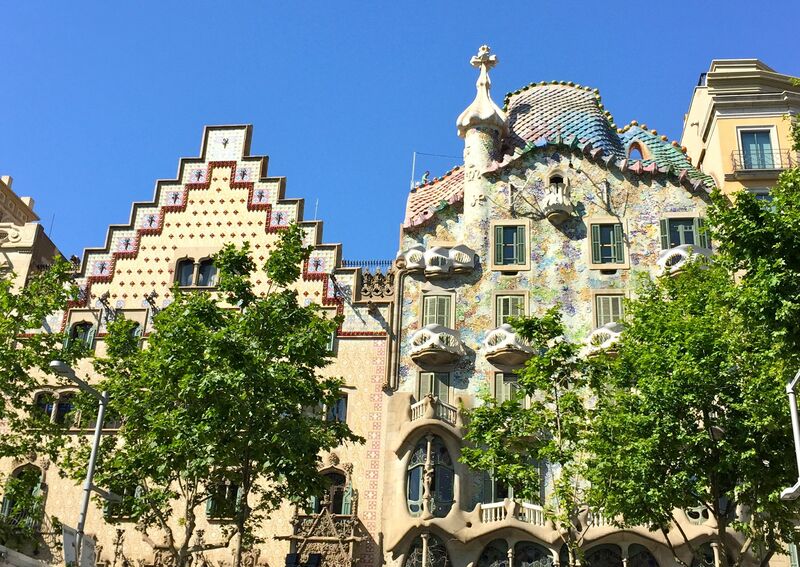 ), Casa Calvet and Casa Batllo with its beautiful inlaid ceramics. 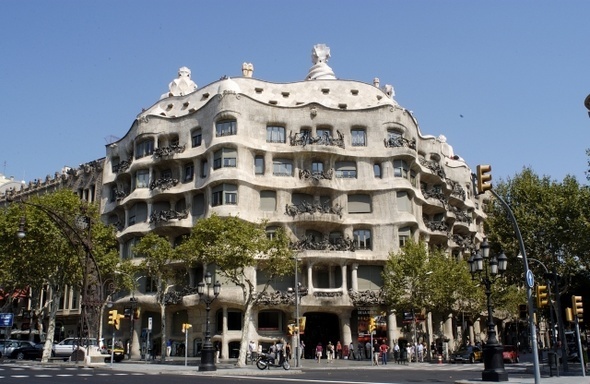 Casa Mia is more of a sculpture than a building really and is nicknamed Pedrera which means the stone quarry. And then there’s Parc Guell at the top of the city, you even have to take outside escalators to get up there. A park like no other, with ceramics to wow, striking buildings and magnificent views over the city towards the sea. So much to marvel at. 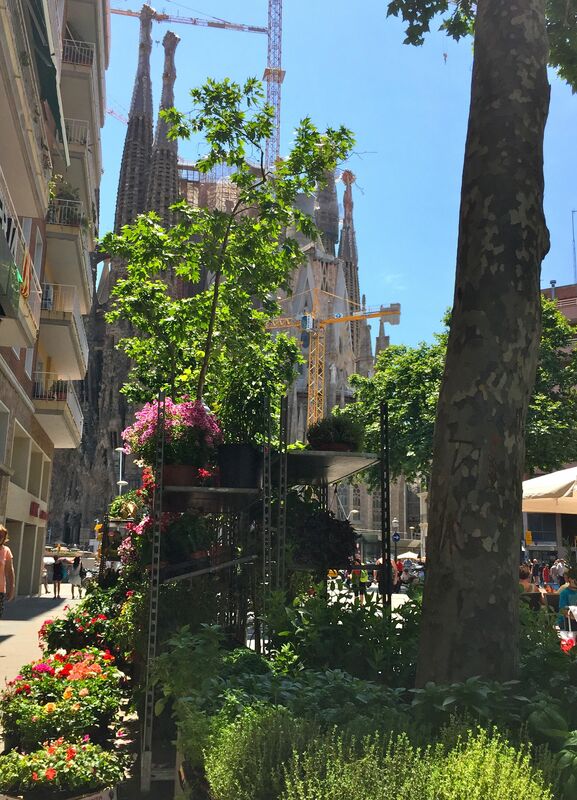 The focal point of the city is Las Ramblas where you simply have to amble. But beware, Barcelona is full of optical illusions, the whole city has a touch of the Gaudi’s about it, if you know what I mean. The paving is flat, not curved as it looks here, but try telling that to your senses. Weird and slightly dizzy-making. 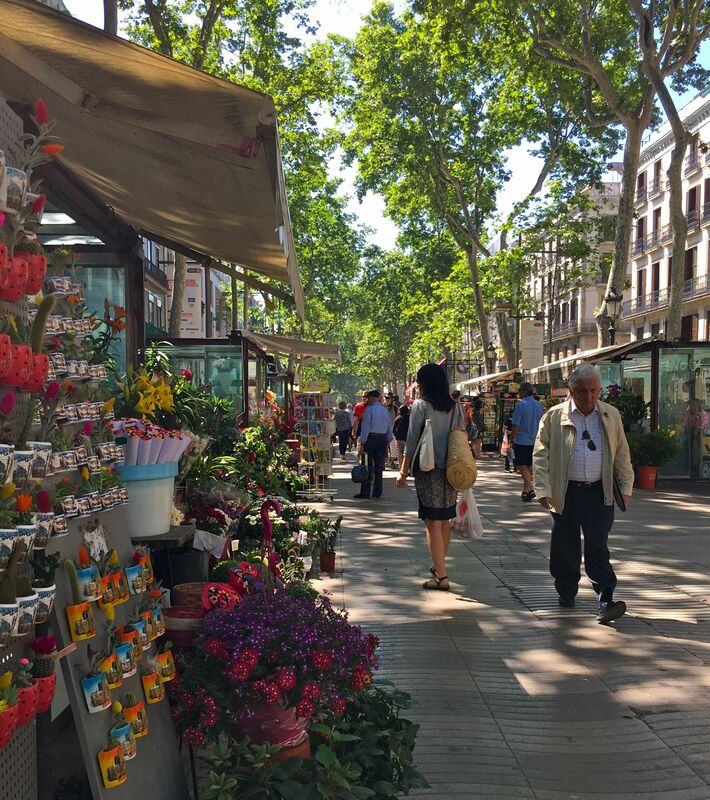 This wide pedestrianised area is lined with market stalls and cafes and the famous food market La Boqueria is on one side. The best food market in the world? 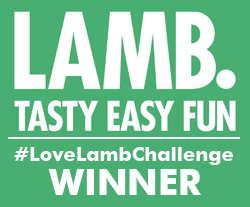 Well, it’s jaw dropping – so much so I have to do a separate blog on it (no surprise there), so watch this space. 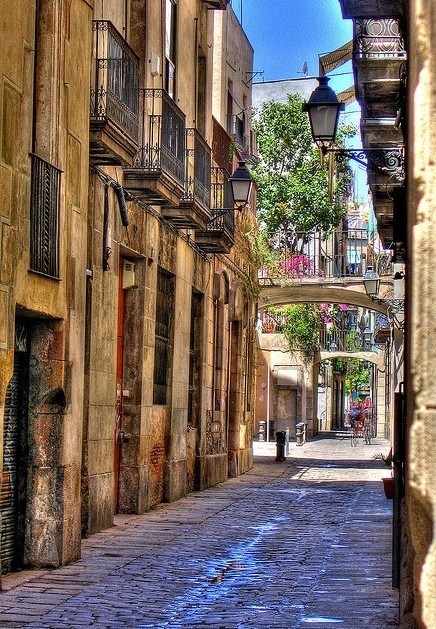 To one side, the fascinating Gothic Quarter with its maze of narrow, winding streets beckons you in. It’s such a contrast to the expansiveness of Las Ramblas and so many of the boulevards of Barcelona. Medieval Barcelona and subsequent buildings have been built on top of Barcino which was founded in 15BC. The original city was only a second-rate outpost covering just 10 hectares. It’s a fascinating place to wander and imagine times gone by with hidden courtyards, Roman remains and lots of spots to stop for refreshment – and no traffic. Barcelona is a big, bustling city so it’s a relief to escape from those automobiles for a while. If you really want to escape, there’s always the beach. Sounds like paradise to me – a city buzz beside the beach. You can see Frank Gehry’s Whale in the background here, another artistic marvel in town. Here it is close up at sunset, taken from the terrace of Arola where we went for dinner (more of that later). 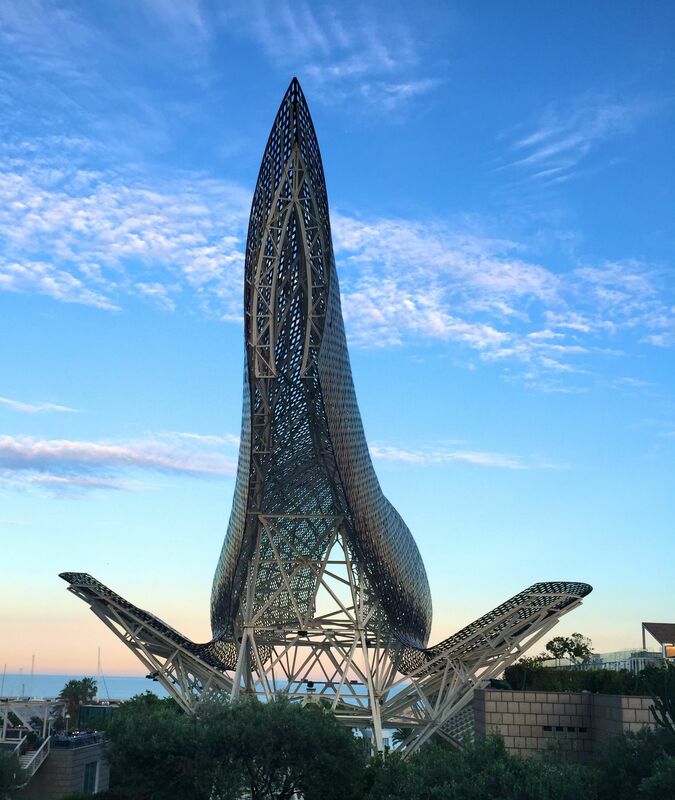 There are plenty of other open spaces and parks to relax in and explore, including the amazing hill of Montjuic which rises above the city near the port. The port area is huge and packed with restaurants. And the shopping is really good (Spain is the birthplace of Zara and Mango after all). A must visit is the legendary Spanish department store El Corte Ingles which is close to Las Ramblas. And of course it is home to current European Champions FC Barcelona – a tour of the Nou Camp has to be on the agenda for football fans. It’s easy to get around Barcelona. There’s an efficient metro, a plentiful bus service and yellow taxis everywhere. Keep your eyes open for their ranks which are dotted around the city. It’s also a great town to walk – there’s something exciting around every corner (no shortage of photo opportunities) – and a cafe or bar every 20 metres (or so it seems), so walks can be punctuated by regular stops. 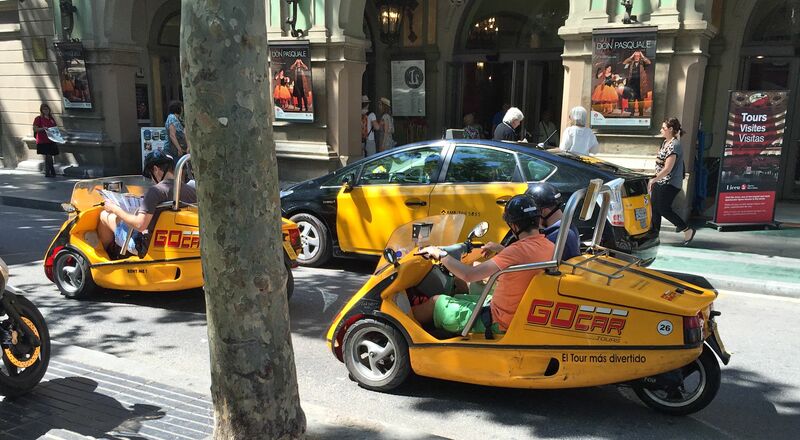 Or try something different – like these little GoCars which we saw speeding alongside Las Ramblas. Restaurants and bars abound and range from the very top end (Michelin starred and pricey) to cosy locals where your wallet’s hardly dented. And there’s the inevitable tourist rip off lying in wait. 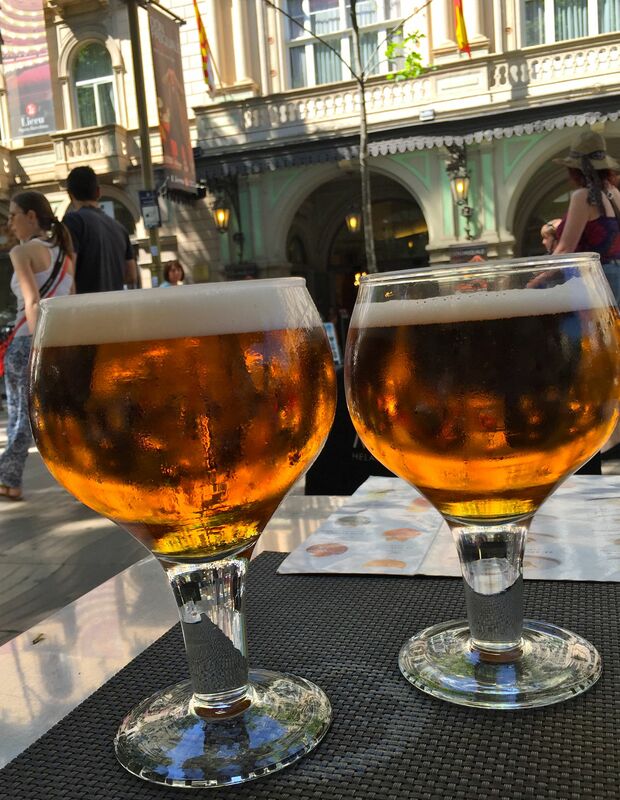 These beers on Las Ramblas may have been giant but they cost €20…in a city where beer is cheap! Having said that, they take some drinking and we did sit and people-watch for ages so perhaps they were value?? 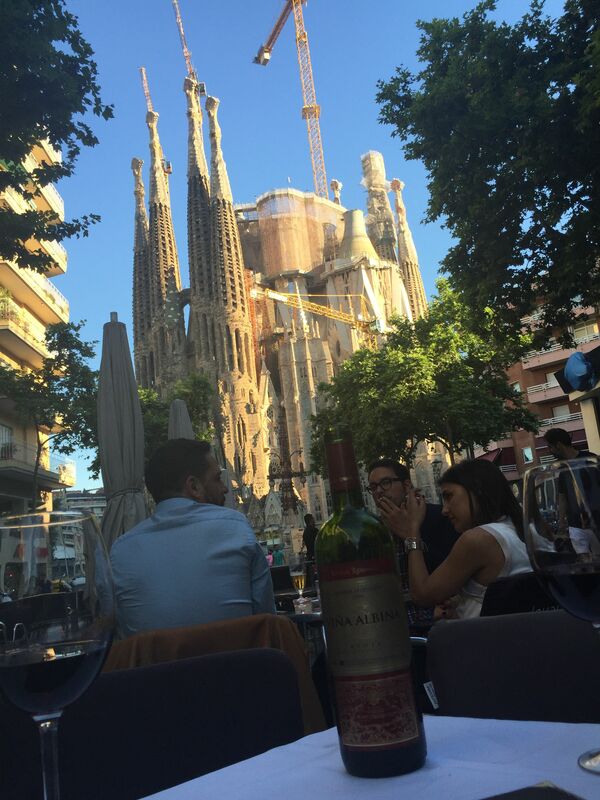 We also managed to get nabbed by probably the most expensive G&Ts in Barcelona, this time in the shadow of the Sagrada Familia. Just something to be aware of. 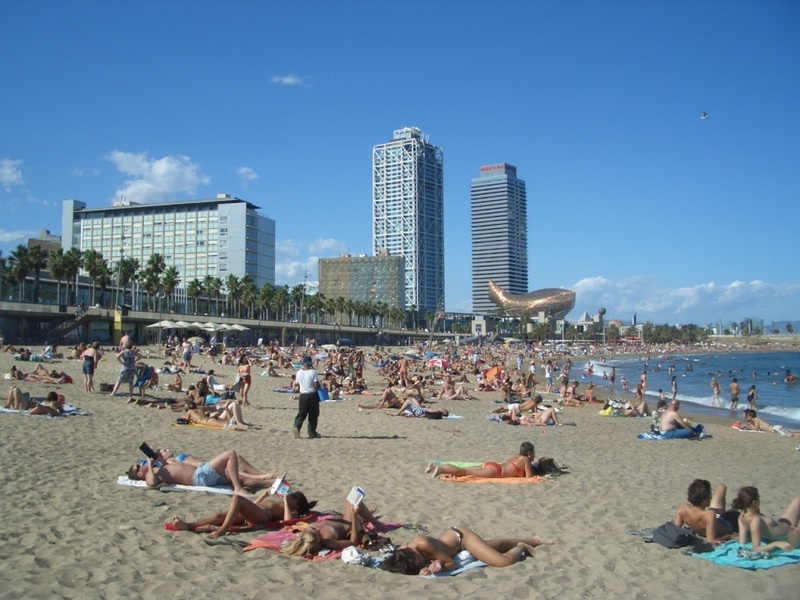 I get Barcelona, it energises me – everything about it. The animated hum of voices, the skyward gazing at fabulous architecture, the alfresco pavement cafe lifestyle, the friendly people, the inevitably blue sky, the beach, the shopping and of course the food, all that fabulous food – but more of that later. This is just a taster of what Barcelona has to offer. If you’re going to the city and have any questions about it, where to stay and what to do, please get in touch and I will try to help.